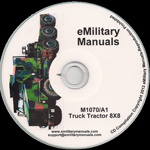 These manuals are used for operation and operator-performed maintenance of HET Tractor: Name and Model: Truck, Tractor, M1070, 8 X 8, Heavy Equipment Transporter (HET). Purpose of Equipment: HET Tractor and the M1000 Trailer form the Heavy Equipment Transport System (HETS). HETS will be used to load, unload, and transport the M1 SeriesMain Battle Tank (MBT) during administrative and tactical operations. Special Inclusions: A Stowage and Sign Guide (WP 0083) and On-Vehicle Equipment Loading Plan (WP 0117) are included with this manual. Tractor vehicle with 86,000 lbs (39 044 kg)GVWR, and 231,400 lbs (105 056 kg) GCWR.Vehicle is equipped with fifth wheel, 3.5 in. (8.9cm) kingpin, two 55,000 lbs (24 970 kg)capacity recovery winches, and a 3,000 lbs (1361 kg) capacity auxiliary winch.